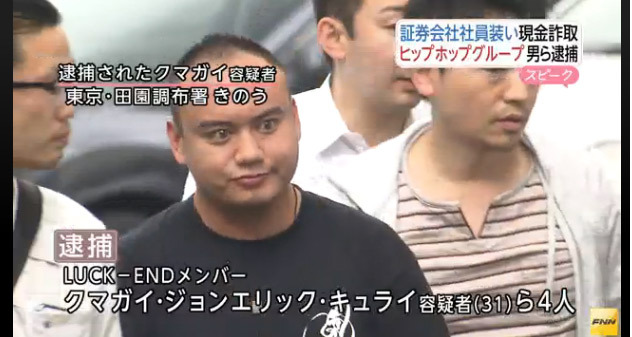 Five members of the Filipino hip-hop group Luck-End have been arrested by police in Japan on Monday after they were charged with swindling. Citing a report from FNN (Fuji News Network), a news article published on the Malago Forum said the group allegedly deceived an old Japanese national to gain 2 million yen. To trick the 78-year-old investor, the suspects pretended as employees of a stock company. They were the ones who made calls to convince the victim to shell out money, the report stated. The suspected swindlers reportedly denied the charges against them. Investigators are also looking into 30 other cases linked to the group. It's been reported that the suspects already amassed 100 million yen.